Hoverboard, how to safely buy one. Hoverboards are more common day by day and since their debut are incredibly desired from people all over the world. The Hoverboard has been also in the middle of some safety related discussion. 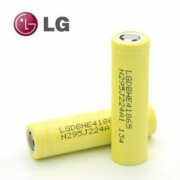 The used batteries are the common Lithium Ion 18650 cells, with a nominal capacity of 2.200mAh. 20 of them are used to assemble the Hoverboard battery pack reaching a total capacity of 44Ah. You will hardly find a manufacturer declaring to use batteries different than Samsung or LG. In fact, few of them really use those brand for a matter of cost and taking advantage from the almost sureness no customers will disassemble the battery pack to double check it, and even if they will it wouldn't be easy to know the truth. The other problem, especially relatively to Samsung, a manufacturer could buy bona fide counterfeit Samsung cells and bona fide sell them to the customers as original. Recently a test has been conducted. 20 products claiming to use Samsung batteries has been purchased from Amazon, some of them from some very popular and high ranked brand. The outcome has been shocking, none of them was an original one, none. You should also wonder why it is possible, and even common, to read ridiculous claims as "Original Samsung Batteries" in some product features. We are still waiting to read "Fake Samsung Batteries" to give a sense to the previous one.Why customers like to bye Samsung, LG, Panasonic, Sony or Sanyo batteries? Does it make sense? What more do they offer from a Grade A+ UL certified produced by some Chinese competitors? The matter is almost purely commercial. Not considering the Japanese ones, amazing products but really too expensive for consumer electronic products, and focusing on the two Korean giants, Samsung and LG, we can state those are safe as the safer Made in China, UL certified ones and properly made ones. About capacity it is exactly the same. So why LG and Samsung are the leaders in this market? Is it only advertising? No-No-No. No. LG e Samsung are really the leaders. Today they lead the development and the growth of these products. They, with the Japanese, are always the first increasing the nominal capacity, the competitors follow them. No. If you are not an expert with a high knowledge about buttery, like we are in Powerseed, and you don't want, or you can't, get this background you better refer to one of these suppliers being sure to buy original products. No. LG e Samsung even got some better features than competitors. Basically those features are not easy to be appreciated on a Hoverboard or in a Powerbank. Every Lithium battery loose efficiency day by day and regardless the usage (around 1% per year) and, above all, the efficiency goes down every discharging/charging cycle. Samsung and LG are those whose efficiency drops slower. A good Chinese battery still got 80% of efficiency after 500 cycles, the Korean sisters from LG and Samsung may be upon this rate after the same cycles. So stated we should make a practical consideration about the chances we have to recharge 500 times a Hoverboard. On average we recharge it once or twice per week, it means 7,5/10 years of usage, after which the device won't stop working, it just got less autonomy. So, why Powerseed uses LG battery for the CommuteBoard? We use LG and not Samsung for two main reasons, quality is the same, 20 LG cells cost few dollars less than 20 from Samsung but, primarily, we are totally sure to buy an original product and not a bona fide counterfeited one. We use LG for merely commercial reasons, we cannot take for granted every customer will read and understand this page. We use LG because our CommuteBoard is used in recreational center and amusement park and even rented. In this particular scenario it happens the Hoverboard is recharged even 2 or 3 times per day. So the 500 cycles must be seriously taken under consideration. The Design, the Manufacturing and its protection is important as well as the cells quality. The batteries. in addition of a high quality, need to be all exactly identical. Superior quality batteries, but even slightly different one from the other, could make the system unstable. It is very important to choose a battery model and keep using it. Also it is very important not to mix different production batches batteries within the same battery pack. This last precaution goes in advantage to manufacturer such as LG or Samsung and their extreme constance. Its protection, due to the use, is as important as the initial quality. Classic Hoverboard design, even those from famous brands, doesn't add any extra protection to this crucial component, limited to a thick plastic film. Powerseed® CommuteBoard goes beyond, we made an ABS protective aerated shell for a total protection and placed it inside the aluminum alloy side frame. 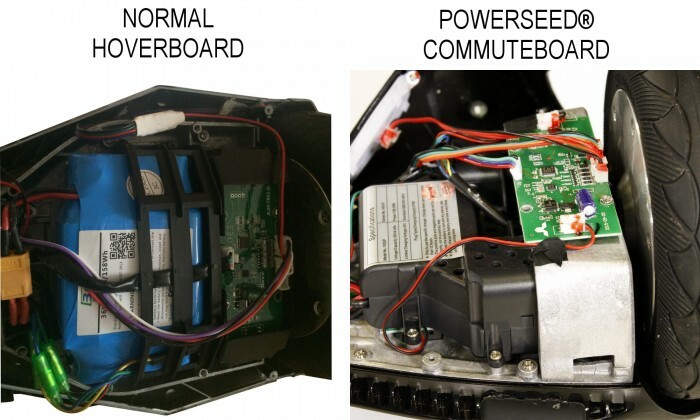 Only the Powerseed® CommuteBoard uses that ABS shell and only the Powerseed® CommuteBoard has a side frame for a superior cycling and resistance. Another crucial component where few USD can make a huge difference and be cause of as serious as pointless troubles. The safe and reliable one is the UL certified one. This certification, even if not mandatory in many countries, must be demanded for simple common sense. A good external charger can protect us from low quality batteries issues. In fact, a good one, beside to give a constant energy output within the parameters imposed by international standards, cut the the line once the batteries are fully charged avoiding overcharging phenomenons. A good battery pack should do exactly the same on the other side. So, if you are not sure about your batteries quality and being external chargers standard you can decide to buy a new certified one for your beloved Hoverdoard. Powerseed® uses the best available one for its CommuteBoard and, even this time, we go beyond protecting the charging port with a rubber cap. The cap take the port perfectly dry and clean from dust. Some expert user may be able to judge the quality of an external charger only touching it and by its weight. But, on the other side, an expert scammer knows how to increase the weight and give a good look to the product keeping a low quality. Be sure about a "true" UL certification and about the presence of the two classic Led lights, Red and Green. Where the Green lit up once the job is done and the charger gave up supplying power to the Hoverboard. Regardless of everything avoid to charge your Hoverboard overnight and out of sight for long time. This must be a kind of universal precaution, not only for hoverboard. it would be a good idea to provide a rubber cap to seal it. Hoverboards are fascinating, useful and funny. They can be used as smart vehicles tand kept on the car trunk. They need to be wisely chosen, and a low price cannot be the only or the main parameter to be considered. If you read those few lines and follow the reported advice you will get a completely safe device. Even if technically safe the Hoverboard is still a Vehicle, such as Cars, Scooter, Bikes and just like them we need to use it. With care and attention. There are different kind and size of Hoverboard, read this page to understand how to choose the right one.